This guide is meant to be a short overview about the audio devices supported by Ozeki VoIP SIP SDK. After studying the following few paragraphs, you will be fully familiar with the usage of microphones, speakers and headsets in VoIP technology. Audio devices are important to have when you work with VoIP technology. VoIP means Voice over Internet Protocol - it is a form of telecommunication that allows to convert analog voice signal into digital data and transmits it over the Internet instead of the traditional telephoning system. As it can be easily found out, voice is an essential part of this technology. That is why having audio devices would be absolutely necessary when working with VoIP technology. Ozeki VoIP SIP SDK for .Net is a software development kit with excellent sound quality support that enables you to easily make VoIP based software applications. The users of these applications (you, your customers, your partners you sell the product to) will need some basic audio devices for the proper working. These devices are mostly speakers and microphones, or headsets. A speaker is an electroacoustic transducer that produces sound in response to an electrical audio signal input, while a microphone (or 'mic') is an acoustic-to-electric transducer or sensor that converts sound into an electrical signal. They make a pair. You speak into your mic, your partner will hear you on their speaker. Your partner speaks into their mic, you will hear them through your speaker and vice versa. A headset is usually a combination of a speaker and a microphone. With Ozeki VoIP SIP SDK you can easily implement any kind of audio device support effectively (Figure 1). 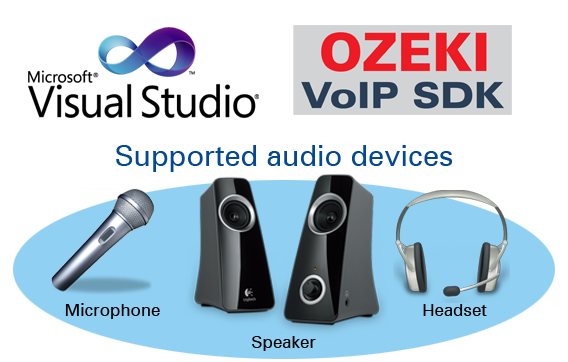 Ozeki VoIP SIP SDK contains an audio device implementation as a base of the SDK. Without spending time with implementing audio device basics you can instantly start your project. This article presented you the basic knowledge about audio devices and recommended some useful example project in connection with its implementation. If you have read through this page carefully, you already have all the knowledge you need to start on your own solution.